Even though we offer installation for all our Dallas-area vinyl fences, some people prefer the accomplishment that comes with installing their fence themselves. A vinyl fence is actually a very good DIY project – they’re easier to install than wood fences and the materials are lighter and easier to handle. That said, you can still make mistakes when installing your vinyl fence. Here are a few of the most common vinyl fence installation mistakes we see. In some ways, poor planning is not just the biggest mistake a homeowner can make when doing a fencing job, it’s the only mistake. Before buying a fence or charting your property or tearing anything down, make sure you plan out every step of the project beforehand. That way you know you’ll have the tools, materials, permits, and anything else you’ll need to get the job done. If something unexpected does happen, you’ll always have your plan to fall back on. If you’re installing a vinyl fence yourself, it’s vital that you follow your property lines closely and avoid accidentally installing your fence on someone else’s land. Making installation mistakes can result in fines or fees from the government, civil suit from your neighbors, and the high cost of having to move and reinstall your fence in the right place. Similarly, you might find that your property lines are further than you originally thought, which could result in running out of fence. Fortunately, you can avoid this mistake pretty easily with some careful measuring and forethought. Request either a property plat (a chart that shows your property lines and measurements) or a blueprint of your property from your township so you can verify the location of your property line. You can also pay to get a survey done by professional surveyors to ensure you don’t make any mistakes. Either way, don’t trust the existing fence line or your gut – always measure and double check. Many townships and neighborhoods (especially those that have HOAs) don’t allow all types of fences, or require owners to have a specific type or style of fence to ensure uniformity across properties. If you build your own fence without following the zoning laws or fence regulations, you could end up facing costly fines, and you might even have to replace your fence to conform with the rules. The best way to avoid this mistake is to check with your local permit office or planning commision to see if there are any restrictions or regulations about the types of fence allowed in your area. If your neighborhood does have an HOA, you should also check with them about the same thing. Fences require digging, and digging means you could hit a utility path. Unfortunately, many DIY vinyl fence installers think that by simply placing their new fence posts in about the same place as their old ones, they’ll avoid striking anything. This is not the case. The process of removing old fence posts and installing new ones can easily put your shovel or post digger in contact with a gas, electric, or other utility path. Instead of trusting your gut, call 811 at least two days before you dig and have your property and project information ready. The 811 operators will contact the relevant utility companies, who in turn will come out and mark your utility lines so you can dig safely. There’s no cost for this service except the time it takes to do, so do it early and stay safe. This final mistake is actually several mistakes in one. There are a multitude of mistakes a homeowner can make when installing their fence, from setting posts improperly to cutting sections prematurely to failing to account for sloping ground. Any one of these mistakes can ruin a fencing project if you aren’t careful. The best way to avoid these mistakes is to read guides or product manuals that specify the right way to handle different situations or circumstances. 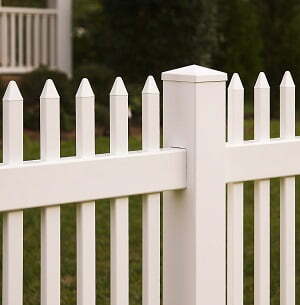 For instance, vinyl fence posts must still be set at least three feet into the ground to avoid shifting later on. If your property is on a grade, you’ll need to measure the angle of the grade and compensate for it by either buying angled fence panels or cutting your panels to match the grade. Not taking these aspects into account can result in a weak or unstable fence that won’t last more than a few years. All things considered, installing a vinyl fence isn’t the hardest job in the world, but it’s not the easiest either. Unless you’re a skilled DIY-er, you might be more comfortable allowing a professional vinyl fence installer handle the work. At Future Outdoors®, we’ve installed hundreds of miles of vinyl fence in and around the Dallas metro area, and that means we have the experience and skill to install your fence right the first time. Contact us today at (972) 576-1600 or visit our Facebook or Google+ pages to learn more. Vinyl vs Wood Decking: Which is Best? How Do I Know if a Fence is Priced Right? Should I Build a New Fence Before I Sell My House?